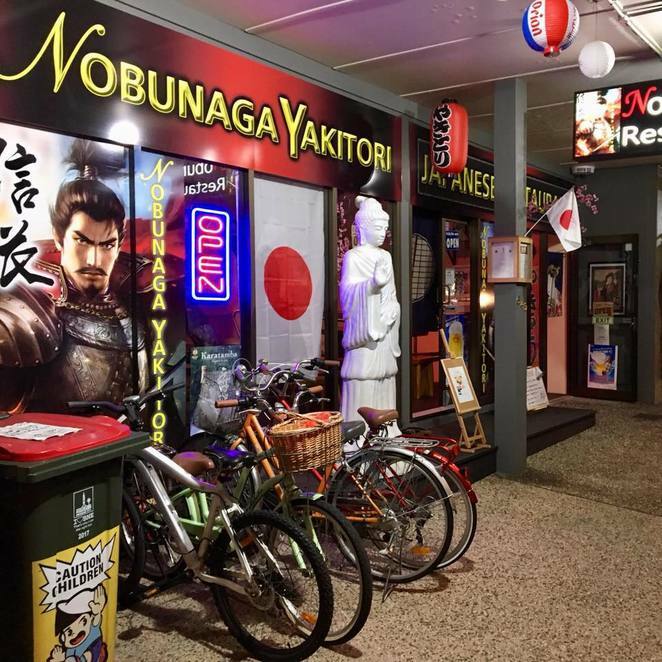 Nobunaga Yakitori is a relative newcomer to the Morningside food scene, helping to fill the 'casual Japanese' gap in the eastern suburbs dining market. Located along Wynnum Road, near established favourites like Curryville and Southside Tea Room, Nobunaga Yakitori has a friendly and informal atmosphere. As yakitori - grilled skewers - are the main event, a long, open charcoal barbeque forms the restaurant centrepiece. In spite of the extraction fan, the air is infused with a warm smokiness that hits you wonderfully the moment you step inside. The walls and shelves are crowded with Japanese masks, swords, prints, fans and flags, as well as the classic 'fake food' display near the front, indicating what a really good yakitori spread might look like. They provide you with instructions for ordering and a hand towel before you begin your yakitori experience. And it is an experience: if you're sitting at the long benches, you get a front-row view of the grilling action, and your fresh skewer is handed straight to you by the chef. The dining style is flexible. You can eat alone or with a group, and order all in one go or build your meal up one small dish at a time. There's an extensive menu of their grill standards, salads and sides, as well as lunch and dinner specials. These can include roux curry, karaage chicken, 'Master's Special' agedashi tofu, and even spicy softshell crab, if you're lucky. They offer okonomiyaki on a stick, and they'll also barbeque up a jaga butta (whole potato with butter). There are enough non-animal options to fill a vegetarian, and enough interesting meats to satisfy a more carnivorous preference. From your regular momo (chicken thigh), tsukune (meatball) and buta negi (pork belly with spring onion) to the less familiar cuts of kokoro (chicken heart) or tongue, available salted or brushed in a salty-sweet chef's sauce. Even the vegetable options showcase the grill flavour, be it the crisp niniku (garlic cloves) or moist and hearty mushroom. Ozuranotamago (quail eggs), when available, also infuse with the charcoal-and-sauce taste delightfully. A yaki onigiri (grilled rice ball) or two make a great little addition to whatever else you're eating, and if you're a seaweed fan the wakame sarada is a must. Beer is, I understand, the usual drink for yakitori, and your choices include Orion, Asahi, Suntory and Kirin. There's also a selection of sake (sparkling and still) and sochu. They allow BYO, with a surcharge. If you're a teetotaller, no fear: they have a selection of standard soft drinks, as well as green tea and CALPIS. To finish, there are a few dessert options, including ice cream or Japanese cheesecake - the matcha flavour has a delightful nuttiness. This spot is fast becoming our Friday night favourite. It's a good idea to come with a group so you can share and sample a range of options, because you definitely won't exhaust the menu in one sitting. If you're lucky enough to live in the Morningside area this is your friendly neighbourhood yakitori, but it's still worth the journey from further afield.